Friday was a treat like no other. Finally a partly sunny day at Hakkoda. You never know what the weather is going to be like until you actually get there as this place has its own weather system. I have been riding here for the last month and I think the sun has only come out on 3 days. Timing is everything. 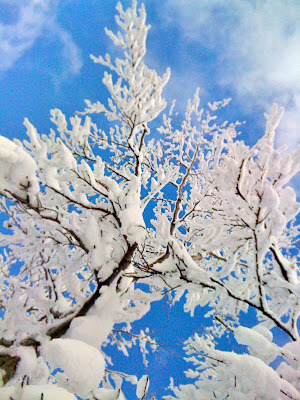 With 35cm of fresh and blue sky yesterday, it was on. 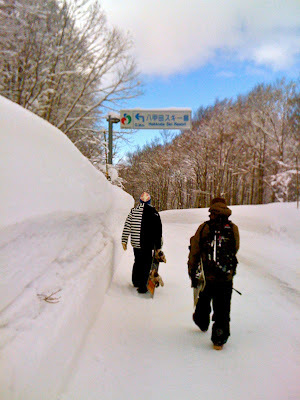 I hitched a ride with About Snowboard Shop owner Mune-san. 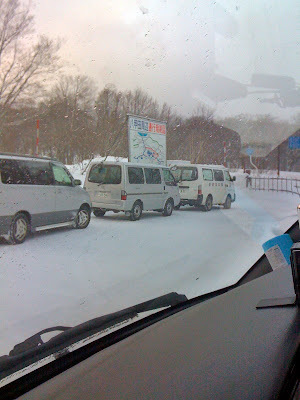 We left Towada at 6:30am and by 7:15am we where waiting in line with the rest of the powder junkies for the road to open at 7:30am. 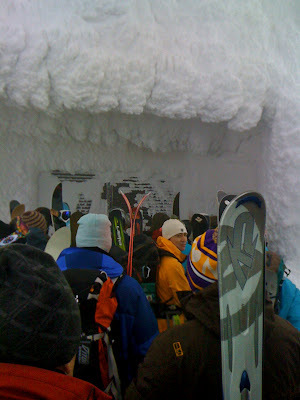 I love the mornings on a good powder day as there is always a buzz in the air while waiting in line for the first tram. The riders are checking their gear and the local car danchi groups are huddled around the heater warming there boots and gloves. 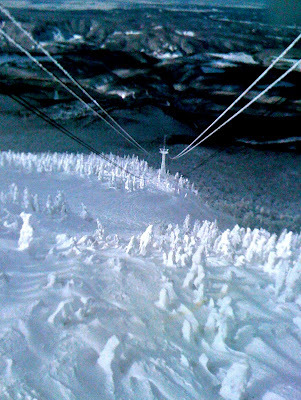 The rest of the day was spent mashing around the mountain with a great crew or riders. Thanks to Mune-san, Koji-san, Yugari-san and Toru-san. I hope I got everyones name right? Here are a few pics from the day and will have to excuse the quality as I only had my Iphone with me to document. 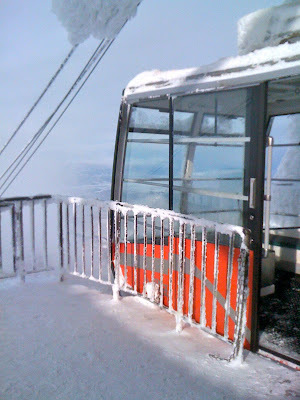 Enjoy and "think snow"
Waiting for the Road to open..
A short walk back to the ropeway. 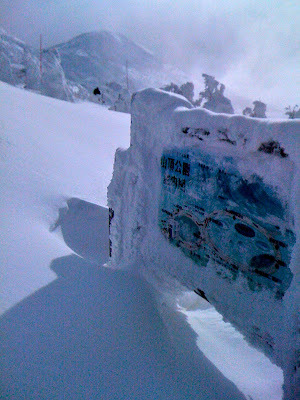 A touch of blue bird..
Over the American Holiday weekend, we went over to Naqua Shirakami formally known as Ajigasawa. 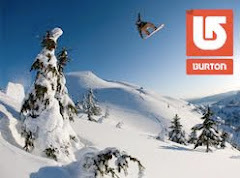 Great on Mountain ski in ski out Hotel and Resort. Apparently you are not allowed to ride in the trees with good reason for most of the Mountain is laid out in slow rolling hills. Although there is one lift that has just enough pitch where you can get some well spaced tree riding in. If you want to know where? Go find it your self, its right under you nose as most powder stashes are. Pretty mellow place to bring the family or a large group of people for all levels of riding. 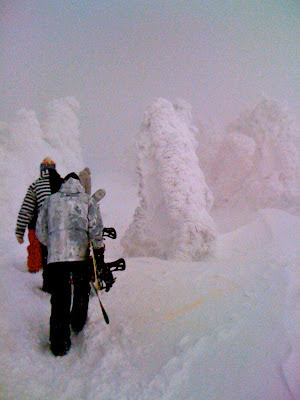 Good snow, good onsen "outdoor" and good times. 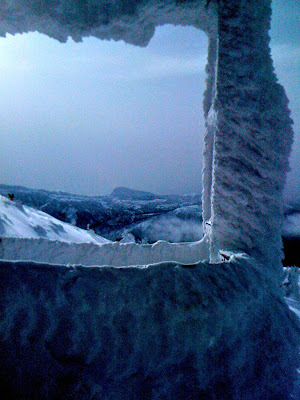 Ajigasawa "One powder lap" from Paul Vanderheiden on Vimeo. 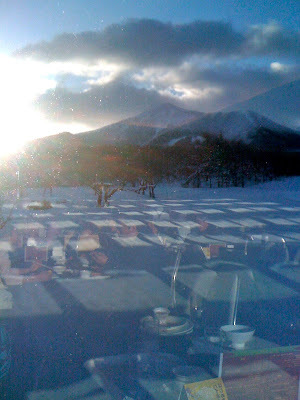 Hotel view "sea of Japan"
So the other day I went back to Hakkoda for a solo mission to find a few more turns. With little recent snowfall I went searching for some fresh lines and found a few. The amazing thing about this place is that it never gets tracked out. I was there on one of the busiest days of the month: (Japanese Holiday) and I had the whole place to myself. 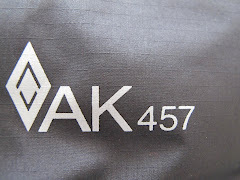 I brought my zero-budget camera along for one run..check it.. You just have to keep searching..
Hakkoda (come ride with me) from Paul Vanderheiden on Vimeo. Finally got to Hakkoda-san on a pretty good day. Face shots, Rooster tails and bottomless turns at times. This mountain is definitely a bit tricky as one wrong turn and you'll end up hiking your way out a gully or ravine in waist-chest deep powder. On this day we stuck to the front side of the mountain but the possibilities are endless with the Ropeway access to the surrounding peaks just a short hike away. 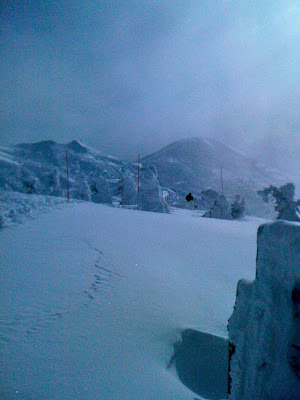 More to come from Hakkoda as I plan on spending quit a bit of time up there in the coming months. 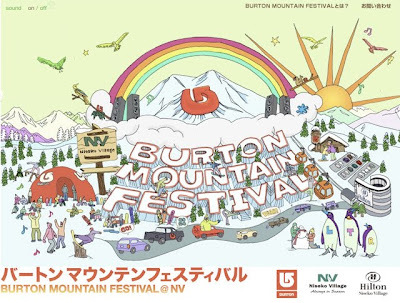 If your in Niseko, Japan in the coming weeks check out the Burton MNT Festival running from the 9th through the 17th of January. 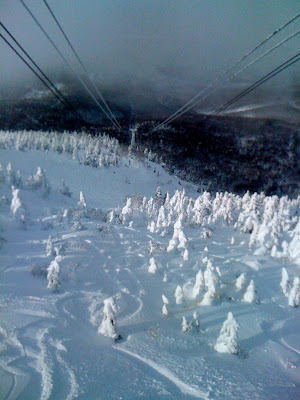 The snow looks amazing up there right now according to Neil Hartmann Biggest storm every blog!